Go green with a matcha tea set. 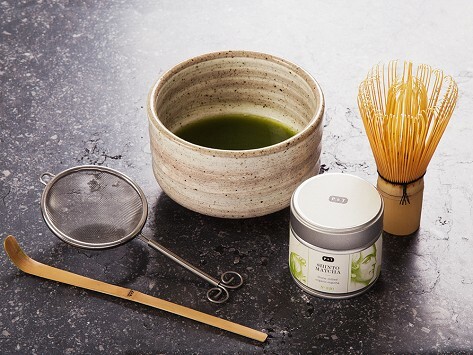 From the traditional tools to the loose leaf tea, everything you need to (literally) whip up authentic matcha is included in this perfectly packed gift set. The Shinto Matcha green tea included is organic and orthodox, meaning it is hand-picked and processed according to traditional practices, and it is sourced from small-scale, non-industrial tea farms. Dimensions: 11.8" x 5.1" x 5.9"
Paper and Tea specialty teas grew from founder Jens de Gruyter’s childhood. A tea merchant uncle introduced him to tea—really good tea—at a young age, and Jens’ passion blossomed from there. He started the Berlin-based P & T when he returned from trips throughout Asia and found the tea back home in Germany to be lacking. Jens wants others to be able to take part in an authentic tea-drinking experience like the ones he had in Korea, Taiwan, China, and Japan. This is why he sources only organic and orthodox teas from small-scale, non-industrial tea farmers in those areas—some of whom he first encountered on his travels. Orthodox means the tea is hand-picked and processed with traditional methods, which is key to Jens. P & T then takes the tea and blends it into unique modern flavors that are tasty twists on classics, like Brave New Earl, a gin and tonic-inspired fresh take on traditional Earl Grey. And to make those loose leaf teas sing, P & T’s modern-looking tools, like a personal teapot and matcha and cold brew sets, are well-made ways to brew your own.